Last night's estimated attendance: 300 people. The crowd was into this one. Yim hit Protect Ya Neck to win. Jaoude & Bononi were just too powerful for 3.0. Martinez hit the South of Heaven chokeslam to win. - We were introduced to Robert Strauss (formerly Robbie E in Impact Wrestling), who is now managing Rinku Singh & Saurav Gurjar. Strauss said he isn't a manager -- he's a brand. Strauss got on the apron to distract the former Jonah Rock, allowing Gurjar to destroy him and score the pin. The crowd was all over the Sons here and did not like them winning. They won with their flying stomp to the held up opponent double-team finish. Eric Bugenhagen’s music hit and distracted Thorne, which allowed Burch to put him down. Bugenhagen and Burch rocked out together after the match. The Sky Pirates put them away with an assisted pop-up elbow drop by Sane. Excellent match that set a high standard for their TakeOver: New York bout. Riddle hit Dream with everything in his arsenal -- including the Bro-Stone -- but nothing could put Dream away. Riddle had Dream down with elbow strikes and was about to lock in the Bromission before he was rolled back for the three count. 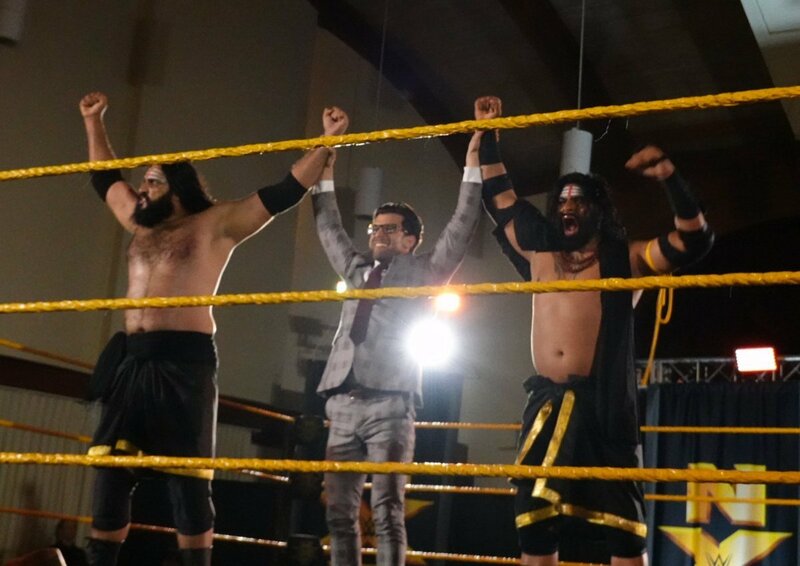 This was my personal NXT house show match of the year thus far.